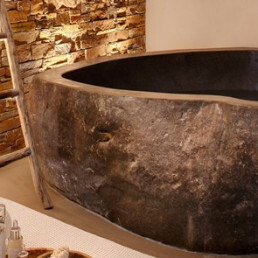 Le Chant des Sapins is located on a quiet country road, used only by local traffic, just outside the small village of Le Saulcy, almost on the border of Alsace & Vosges. From the elevated location of the house you have breathtaking views of the pine tree covered hills of the Vosges. 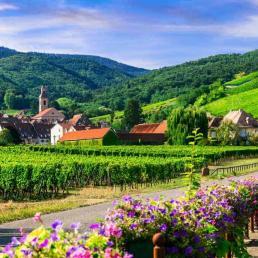 Alsace is one of the most beautiful areas of Nothern Europe. With its extensive vineyards (the famous ‘Route du Vin d’ Alsace’), its charming timber-framed houses and its excellent restaurants. 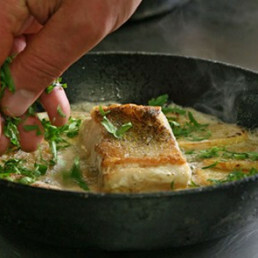 Voges on the other hand offers a wide range of winter and summer recreation facilities. The many skiing slopes of La Bresse (1350m, 35 slopes) and Gerardmer (1140m, 21 slopes) are both about 1 hour away. 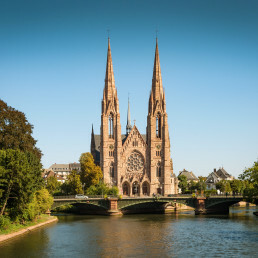 The cosmopolitan city of Strasbourg can be found at 1 hour drive. Here you find various (Michelin starred) restaurants, luxury shops and its UNESCO heritage, historic city center “La petite France”, has everything for an ideal day out. Closer to the house, several scenic hiking routes start just outside the front gate. At less than a kilometer, a nearby lake offers trout fishing for fishing enthusiasts. Moreover, horseback riding can be arranged on own grounds, on the other side of the road. In the village of Belval (only 1.000 m from the front gate) you will find a pizzeria, while the town of Senones (only 8 car minutes away) has a variety of shops and supermarkets, as well as a weekly market. With several scenic hiking routes just outside the front gate, a fishing lake and horseback riding possibility, the close surroundings offer a variety of activities. The neighbouring village of Belval has a pizzeria, while the town of Senones (only 8 car minutes away) has a variety of shops and supermarkets, as well as a weekly market. 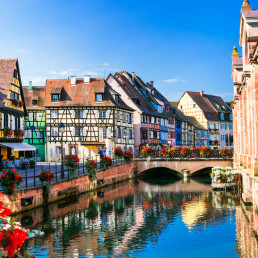 At only 1 hour’s drive you find the cosmopolitan city of Strasbourg. One of Europe’s two capitals and the seat of the European Parliament. Various (Michelin starred) restaurants, luxury shops and its UNESCO heritage historic city center have everything for an ideal day out. Strasbourg also has an international airport (45 min drive from Le Saulcy). The beautifully located ski pistes of La Bresse and Gerardmer, at aprox. 1 hour drive away, offer many winter sport possibilities for all levels in the midst of the Vosges mountains. La Bresse is the largest with 35 slopes at an altitude of 1350 meters. Gerardmer has the most beautiful tracks of the Vosgean Solid mass with 40km of pistes at an altitude of 1140 meters. 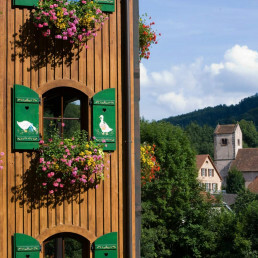 The Alsace wine route starts at a 45 minutes’ drive, with charming villages, romantic timber framed houses, wine cellars and its renowned restaurants along the way. 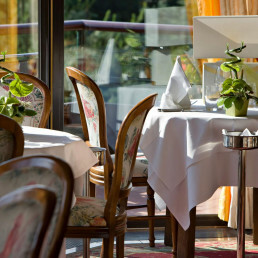 Le Chant des Sapins is perfectly located for those appreciating French cuisine, as Alsace is one of the top culinary regions in France. 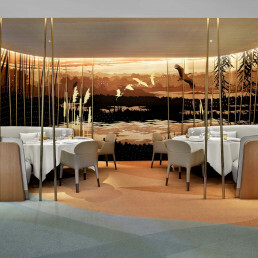 At a few minutes’ drive you find several fine dining locations, while one of France’s best restaurants, the 3 star Michelin restaurant Auberge de l’Ill is slightly further afield. 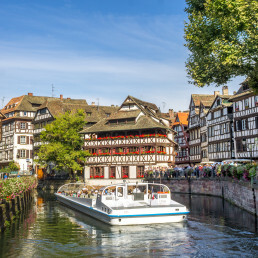 At one hour drive you find the cosmopolitan city of Strasbourg, with its historic city centre, many restaurants (7 of which have a Michelin star), fashionable shops and lively streets. 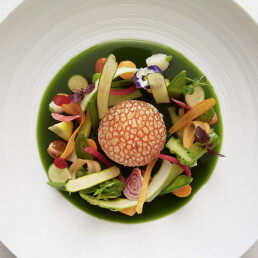 One of the best restaurants in France, holding 3 Michelin stars for the last 50 years.